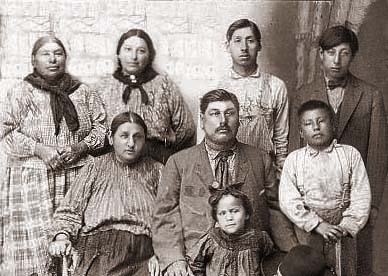 There are hundreds, perhaps thousands, of photographs from Iowa and Otoe families. A few representative ones are shared here. The Photo Album Index is alphabetized by last name of family. Thanks to all the tribal members who have shared their family photos, including: Jean Dobson Sellars, Elizabeth Denious Cessna, Richard Murphy, Mike Graalfs. For more photos (including images from the Smithsonian) and paintings see the history portion of the website. The three Deroin brothers, ca. 1880. From left to right: Balon Deroin, Emile Deroin, and William Deroin. Sons of Joseph De Roin and SuSee Baskette. Photograph of the Peter Murphy family, ca. 1900. 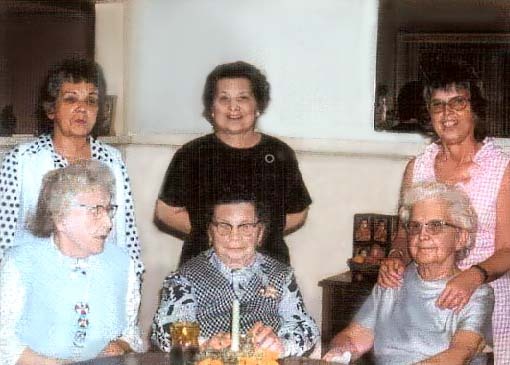 From left to right: Aileen Murphy, Mary Story Murphy (mother), Pauline Murphy, Leo Murphy, Clarence Peter Murphy, Peter Murphy (father), Ellsworth Murphy. Peter Murphy was the son of James Murphy and Margaret Le Duc. Photograph of some Murphy family members in Kansas in 1975. In back, left to right: Leonard Fee, Pauline Murphy Fee (holding Don Scott, stepson of Milke Graalfs), Ellen Graalfs, Betty Murphy Graalfs. In front, left to right: Alma Murphy Fee, Mike Graalfs, Marvin Murphy. Daguerrotype of No Heart, brother of White Cloud (Mahaska) I, son of Mahaga; uncle of White Cloud (Mahaska) II, or Francis (Frank) White Cloud. No Heart was chief of the Ioways, after White Cloud II was ousted. Jennie Rouleau Roubidoux with daughters Carrie and Amanda. Circa 1880s. A group shot of Iowa chiefs. Please help with identification if you can. A group shot of Iowa chiefs at White Cloud's home. From same photo shoot as above. Shot the same day as the above at White Cloud's home, 1 May 1890. Shot the same day as the above at White Cloud's home and the Ioway church, 1 May 1890. Ioway schoolboys. Please help with identification if you can. For text only version of page go here. Copyright information | This site is hosted by NativeWeb.